This book contains a complete and accurate mathematical treatment of the sounds of music with an emphasis on musical timbre. The book spans the range from tutorial introduction to advanced research and application to speculative assessment of its various techniques. All the contributors use a generalized additive sine wave model for describing musical timbre which gives a conceptual unity, but is of sufficient utility to be adapted to many different tasks. 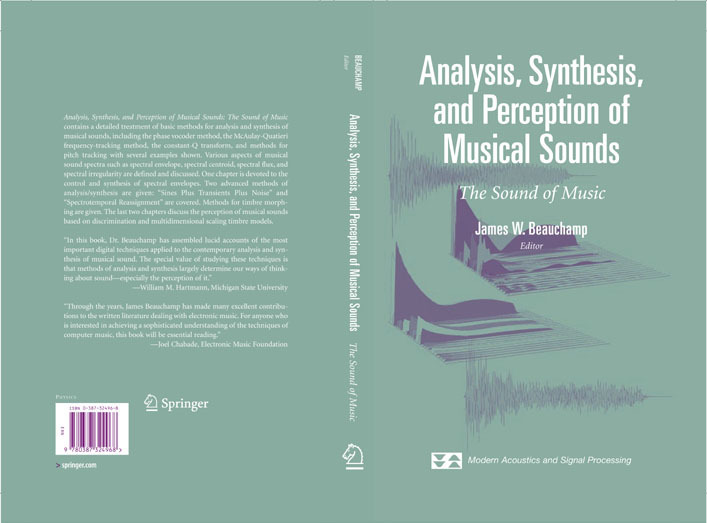 James W. Beauchamp has been working in the area of analysis, synthesis, and perception of musical sounds for over 40 years. He is editor and co-author of Music by Computers (Wiley, 1969), a fellow of the Audio Engineering Society and of the Acoustical Society of America, former president and board member of the International Computer Music Association, and has published numerous papers in the Journal of the Audio Engineering Society, the Journal of the Acoustical Society of America, the Computer Music Journal, Proceedings of the International Computer Music Conference, Proceedings of the International Conference on Music Perception and Cognition, Proceedings of the International Society of Musical Acoustics, and Proceedings of the IEEE Workshop on Applicatiions of Signal Processing to Audio and Acoustics. For over thirty years at the University of Illinois at Urbana-Champaign he taught courses on musical acoustics, electronic music, and computer music (in the School of Music) and audio engineering, electronic music synthesis, and acoustics (in the Department of Electrical and Computer Engineering). During spring, 1988 he was a visiting scholar at the Center for Research in Music and Acoustics at Stanford University, and during 1994-95 he was a visiting researcher at the Institute for Research and Coordination in Acoustics and Music in Paris. His research interests have been in electronic and computer music synthesis systems, analysis, synthesis, and perception of musical instrument sounds, automatic pitch detection, and instrument separation. Analysis and Synthesis of Musical Instrument Sounds: Analysis/Synthesis Methods.Analysis Results using SNDAN.Summary.- Fundamental Frequency Tracking and Applications to Music Signal Analysis: Introduction to Musical Signal Analysis in the Frequency Domain.Calculation of a Constant-Q Transform for Musical Analysis.Musical Fundamental Frequency Tracking using a Pattern Recognition Method.High-Resolution Frequency Calculation Based on Phase Differences.Applications of the High-Resolution Pitch Tracker.Summary and Conclusions.- Beyond Traditional Sampling Synthesis: Real-Time Timbre Morphing using Additive Synthesis: Introduction.Additive Synthesis Model.Additive Sound Analysis.Navigating Source Timbres: Timbre Control Space.New Possibilities for the Performer: the Continuum Fingerboard.Final Summary.- A Compact and Malleable Sines + Transients + Noise Model for Sound: Introduction.System Overview.Multi-Resolution Sinusoidal Modeling.Transform-Cided Transients.Noise Modeling.Applications.Conclusions.Acknowledgement.- Spectral Envelopes and Additive + Residual Analysis/Synthesis: Introduction.Spectral Envelopes and Source-Filter Models.Spectral Envelope Estimation Methods.Representation of Spectral Envelopes.Transcoding and Manipulation of Spectral Envelopes.Synthesis with Spectral Envelopes.Applications.Conclusions.Summary.- A Comparison of Wavetable and FM Data Reduction Methods for Resynthesis of Musical Sounds: Introduction.Evaluation of Wavetable and FM Methods.Comparison of Wavetable and FM Methods.Results.Conclusions.- The Effect of Dynamic Acoustical Features on Musical Timbre: Introduction.Global Time-Envelope and Spectral Parameters.The Experimental Control of Acoustical Variables.Conclusions and Directions for Future Research.- Mental Representation of the Timbre of Complex Sounds: Timbre: A Problematic Definition.The Notion of Timbre Space.Categories of Timbre.Conclusions.